A few years back, hunters noticed an incredibly large boar on camera. The boar was marked for death -- but it took until now for anyone to bring it to justice! Hunter, Jett Webb, shot and killed the beast with a .308 rifle after stumbling across it almost by accident. "I just set out to put a little meat in the freezer," he says. "But afterwards, I was completely blown away." Actually, Webb had been hunting the boar after spotting it in the area earlier in the week. He bagged a similar-sized hog a year or so back that is mounted on the wall of the hunting club to which he belongs. 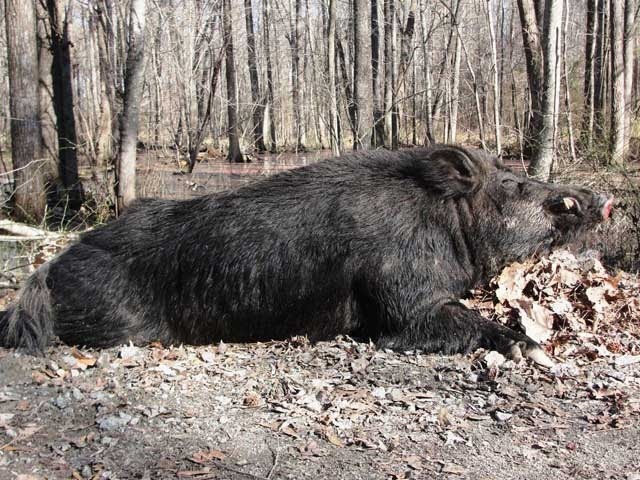 Wild boars in North Carolina, and North America in general, usually weigh up to 180-lbs. While Jett Webb's 500-lb. catch was certainly remarkable, it was not the largest boar killed in North America!